Now a days many new 3D technologies are coming, increasing the access to people. Sony has already been recording and broadcasting FIFA world cup matches live in 3D. 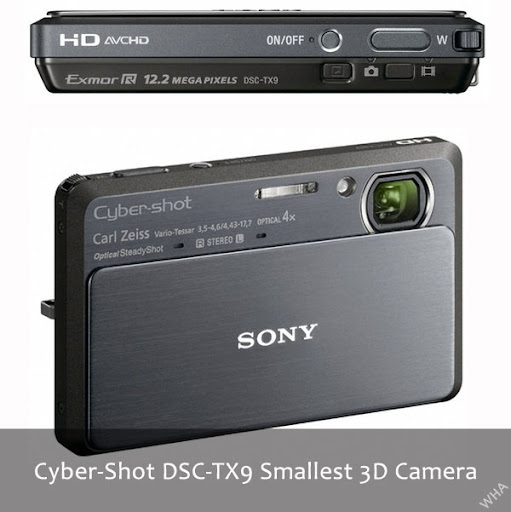 One step further Sony unveiled new cyber-shot digital cameras (DSC-TX9 and DSC-WX5) which are world's smallest 3D cameras. If this is less, TX9 and WX5 capture 3D images with a single lens system instead of those traditional stereo lens system. 3D is a very vast area and includes many new innovating researches. This is why I am highly interested in it and usually feature related products. About the traditional 3D stereo lens system, it consists of two lenses separated by some space and tilted to some angle, so this helps in capturing two angle images/videos along with depth/distance of object/subject. 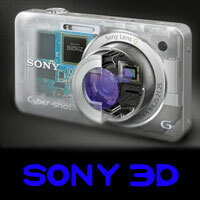 But Sony's new cyber shot digital cameras incorporate innovating 3D technology - 3D Sweep Panorama. “Sony is focused on being the leader in 3D technology, leveraging its expertise to create the best 3D products, content and unique entertainment experiences,” said Kelly Davis, director of the digital imaging business at Sony Electronics. 12.2 megapixel Exmor R CMOS Sensor and new Superior Auto mode for superb images w/ DSLR-style low noise performance. 1080i Full HD movie recording for playback on your HD TV. World’s first compact still cameras with 3D Sweep Panorama. Sweep Multi Angle for exciting 3D style viewing effects. Background defocus mode for stunning professional effects. 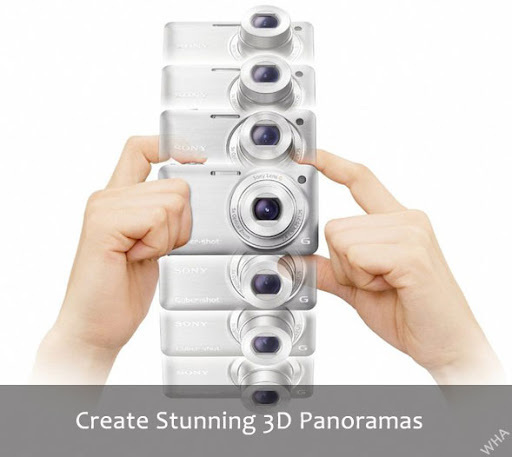 Want to Create 3D Panoramas Yourself? Both digital camera models (DSC-TX9 and DSC-WX5) feature 3D Sweep Panorama. You have to take pictures in sweep motion - tilt the camera back and forth, 15 images will be automatically processed to detail-packed 3D panoramas. All images are then compiled to one single photo. The 3D images can be viewed 2D/3D/3D compatible TVs, which also requires 3D glasses available to buy at Sony Store. This method is mainly used by Game developers to focus on object they make the background blurred, know as bokeh effect. If do so in photo editing software manually then you won't ever get perfection. To shoot such photos, DSLRs dominate. But Sony Cyber Shot can do all for you smartly, It distinguishes between object or the subject of photo and the background very well, creating sharp and crispy digital image, emphasizing on subject more. 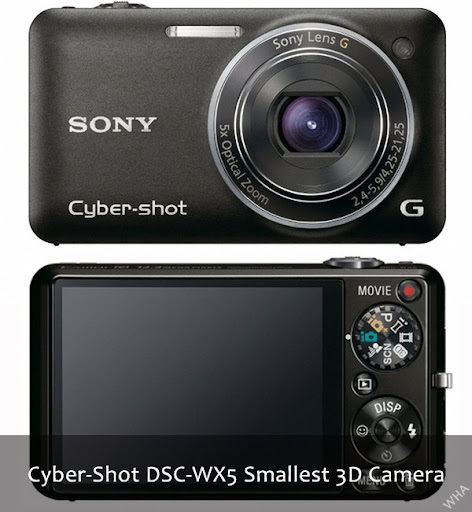 Sony cyber shot may be this time liked by DSLR owners too. Superior Auto mode makes image cleaner, sharper and more dynamic pictures also by use of an extension Intelligent Auto mode comprising multiple shots. Soft Skin mode is the another feature which recognizes skin tones and reduces the appearance of real world imperfections. The cameras provide good performance at low light with Sony's Exmor R back illuminated CMOS (Charged Metallic Oxide Sensor) sensor. The cyber shot models can record full HD movies at resolution of 1080p (ie 1920x1080) in ACCHD format (Sony's High Definition Handycam Camcorder Videos), also at resolution of 1440x1080 in MP4 formats, suitable for online sharing and streaming. Meanwhile Sony also unveiled DSC-T99, lets include it here briefly. Sony will start selling these 3D camcorders by September this year at Sony Style and stores. DCS-TX9 will cost about $400 (approx Rs20K), DCS-WX5 about $300 (approx Rs15K), & DCS-T99 about $250 (approx Rs12.5K). Well, these are great cameras and value of money products from Sony specially if you are an amateur photographer. Even it's said that DSLR owners will also give it good response, since its compact, light in weight, easy to use, and many other useful features. The most important parts are 3D and HD. Now Sony is dominating in the field. I wish to own Cyber Shot DCS-WX5, what about you? Did you like any of them? Do you see any competitor of Sony around? We love to hear from you. With such cool features who will not like to own it :).Amazing features. I always love gadgets from sony.Planning to buy DCS-WX5. Has anyone bought WX5, I would like to hear first hand reviews from users who have actually used it. I am raring to order one from US.